16a. [Doesn’t buckle under pressure], BRAVES THE STORM – Atlanta; Gary and I enjoy how Vermont is often referred to as the “brave little state.” The nearby town of Vergennes is called “the little city” as well; do you think we have a complex about our size? 21a. [Electron beams], CATHODE RAYS – Tampa Bay; this entry reminds me of the faintly glowing green CRTs of my young adulthood. We had to turn them off or the image would burn into the screen! 38a. [Two-part Tony-winning play revived on Broadway], ANGELS IN AMERICA – Los Angeles; for some reason, I was thinking this was in three parts, but perhaps I was thinking about Harvey Fierstein’s Torch Song Trilogy instead. 58a. [They’re qualified to captain any merchant vessel], MASTER MARINERS – Seattle; say what? So the obvious next step is to concatenate the first letters of all the teams’ locations; I wasn’t sure if I should use both the TB of Tampa Bay and the LA of Los Angeles, but neither approach seem to work well, as you get ATBLATS or ATLTS depending on which method you use. The former is very close to “at bats,” which is a sports (and appropriately, baseball) statistic, so I wondered if there was a way to get an A for the Angels that was consistent with the other entries. (I’m assuming that this “new era” version of the Rays’ cap wasn’t intended for this meta.) . So reading from left to right, AT BATS seems to be what Matt was aiming for after all. I liked how the meta was a bit more complicated than just recognizing the team names in the theme entries, especially with the use of that “TB” in a baseball-related term. I’ll close with my favorite clue, [Hope you can laugh at] for BOB. Nice one! Fun puzzle. Condolences to Matt. I should’ve made that connection as well! But perhaps it would’ve also sent me down another rabbit hole, so it’s just as well I didn’t. Nuts. I thought the all caps clue referred to the five clues that contained all caps: YHOO, NCAA, MIB, REM, and MGM. I was in rabbit holes all weekend. Way overthought this one. I went that same route with the caps. And also went nowhere. OH WELL. Nice graphic of the caps, Evad! The Angels are actually based in Anaheim in Orange County. Their official name is Los Angeles Angels of Anaheim. So, living in Southern CA, I got the “A” and the answer right away. This association may not have been the constructor’s attention but it worked. But then you’d want to use Arlington for the Rangers. They used to be just the “Anaheim Angels,” but they wanted to market themselves to the whole metropolitan area, and so became the “Los Angeles Angels of Anaheim,” thus adhering to a clause in their contract with the City of Anaheim that required them to always have the word “Anaheim” in their name. The City sued them anyway, claiming that having “Anaheim” at the end of the name was insufficient, but the city lost the case. 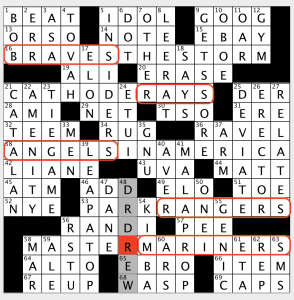 As for the meta, I guessed that it was going to be AT-BATS from the title, and confirmed that as the answer after getting halfway through the grid. Never paused to finely parse any distinctions between ballcaps and team names. Just FYI the team I believe was originally the California Angels and had a logo with an outline of the state and another that was CA. So it’s a complicated history as you indicated. My Anaheim leap of logic got me the right answer but I agree the letters on the caps are the key. The team was originally the Los Angeles Angels. They changed to be the California Angels to show they were more than LA but I guess the Orange County Angels was not big enough since people come from Riverside County and other places. Curt Gowdy used to always call the California Angels the “Anaheim Angels” when he did the play-by-play. He got into trouble, apologized on TV and vowed to always call them by their right name (at that time). 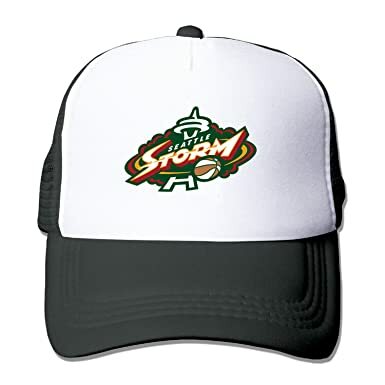 Hey, I’m from Atlanta and I spent some time thinking, “There’s a basketball team called the Storm, right?”. I will forever be amused by the fact that the five AL West caps can be rearranged to spell ASSHAT. I may have rated this puzzle twice. Tried to do it on my phone, but the Submit button did not seem to have any effect, so I went to my desktop computer. But now, on my phone again, it’s showing that I have rated the puzzle. Oops. Sorry.